The Waldorf approach to geography is holistic and seeks to understand differences and similarities across the globe. The human being is of central importance and, as with everything else in Waldorf education, geography is addressed in relation to the human being and his relationship to the Earth. Factoids and data unrelated to context are avoided. There is no random memorizing of place names or of the main exports of country X as one so often finds in conventional approaches to geography. Instead, the child is led from her natural perspective of being at the center of the universe – or the Earth – out into an appreciation of the glory both of the Earth itself and of human activity on the Earth. By building an ecological perspective as well as a human-centered one, a child is in a secure position to be able to understand both the constructive as well as the destructive role that human beings have played on our Earth. By starting with the positive, by emphasizing that this is our shared home which we need to take good care of, a child is in a good position to act wisely in the world instead of avoiding the pain of engaging in the many challenges that humanity faces. Geography proper begins after the 9 year change, in 4th grade. The child has now separated somewhat from his immediate environment and is able to step back and engage sympathetically with the larger world. The ability to draw a birds’ eye view map is an exercise found in 4th grade – one has to be able to stand apart from one’s surroundings to do such a drawing and this is a wonderful challenge for a 10 year old! The geography component of the Christopherus Curriculum is broadly based on the sequence usually found in Waldorf schools. Having said that, geography, because of its nature, is a subject that needs to be adapted to suit children not only in various parts of the world, but also to suit the progression of lessons as seen best by each individual teacher. No two Waldorf schools approach geography lessons in the same way. In order to do this, we have pushed forward the usual flow of the geography curriculum. 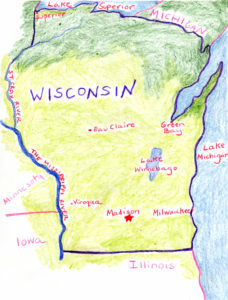 In most Waldorf schools, 4th graders focus on local geography. In the US this would be their neighborhood, town/city and State. In Canada it would go up to Province; in places like the UK, this would go up to the level of the county or region. In our curriculum, 4th graders not only do local geography, but geography of country as well. We feel that modern children have more of a global consciousness than children in past generations and that therefore this larger study is not inappropriate for 4th graders. Then in 5th grade, parents will find a block we have created – “Our Neighbors.” There is an appalling lack of awareness in the United States of our next door neighbors. We’d like to address this by having a 5th grade block featuring Canada, Mexico and the countries of the Caribbean. Another issue which is important for us is to ensure that children receive geography lessons about countries before those parts of the world became a focus for European imperialist attention. So, in 7th grade, we present geography blocks on South and Central America, Africa and Asia to work with preceding any main lessons on the Age of Discovery. One never wants children to get the impression that “nothing happened” in a place before Europeans arrived there. Of course, during, for instance, Ancient Mythologies in 5th grade, one will present the geography of India, Egypt and Mesopotamia as a matter of course. But one also wants to go deeper and into the modern world through further specific geography lessons. Here is the “in-progress” outline of our geography curriculum for all 8 grades. Until all the materials are created, it is likely that there will be some changes! Please bear with us. Awakening to place and time via seasonal festivals, nature stories, gardening and outdoor activities. Love of place and a sympathetic, reverential attitude to our Earth is a priority. Similar to 1st Grade but a bit more focused. Nature stories, weather observation and hands-on work involving biomes (making a terrarium for instance) (see Science outline). Stories of People of the Desert, People of the Rain and Mist, People of the Plains and so on carry profound messages of how human beings have lived (and some continue to live) in different environments. Lessons in farming, gardening and practical projects (housing) deepen this. Local geography; geography of one’s country. In North America, much of this will build upon 3rd grade Native American studies in terms of the very different regions across this land mass. In other parts of the world, homeschoolers can do similar: Australians, for instance, are encouraged in 3rd grade to base some lessons on Indigenous Peoples. In 4th grade, much geography work will pick up on this. Map skills are introduced. “Our Neighbors” – for the US this would be Canada, Mexico and the Caribbean. For Britain, it would be France, Ireland and perhaps the Netherlands, Iceland, etc. And so on. Geography of Europe, the Middle East and North Africa. Scale and proportion in map making. Geology, weather, climate and biomes which takes place during a study of earth science–see our Earth Science materials here. South America, Africa and Asia. Studies of the Great Explorers (Ibn Battuta, Magellan, Columbus etc) and the development of navigational tools. Contact and trade between various cultures. Astronomy features in the Christopherus 7th grade curriculum (see our A Year of Astronomy here), especially in relation to the Earth and the human being awakening to a new relationship to his/her place in the cosmos. Australia, New Zealand, countries of the Pacific. The Ocean. World Geography as a recapitulation of last years’ study of history.